As time-to-market requirements shorten, many organizations are adopting agile development methods especially for new business development projects. Capgemini provides a range of end-to-end services to help organizations make a seamless transition to an agile environment. According to the World Quality Report 2015-16, 76% of the executives interviewed, maintained that the highest QA and Testing strategic priority for an organization is to protect its corporate image. With the increased adoption of agile and Devops delivery, the QA and testing has to support faster software development lifecycles and avoid becoming a bottleneck, slowing down the software releases. A higher level of IT spend for QA Testing in this year indicates the need for greater levels of testing efficiency to keep pace with the Digital transformation. The challenge to move faster to the market is resolved by the adoption of agile and DevOps mode of delivery. Agile has become widely adopted and is being scaled to enterprise level. Around 54% of the respondents have adopted agile development with testing as an integral part of it. a lack of professional test expert team (31%). With dedicated Centers of excellence for Agile, DevOps, TEM, TDM, Automation Performance etc., Capgemini team is able to effectively manage and focus on the collaboration of integration across the various streams of software development lifecycle. While agile works best with collocated teams, the fact of the matter is that the world could not be more distributed, with varying levels of skills, maturity, and goals. Aligning this using the standardized toolkits, templates, and framework is one of the key propositions from Capgemini. Agile Toolkit enables an effective and efficient start of a program following agile methodology. Each phase of the software development lifecycle is enriched with an existing set of standardized guidelines and templates. The research shows an increase in automation from 28% to 45%, and to meet up with such growing demands, Capgemini’s Automation toolkit provides a finely designed framework, easily adaptable to the agile mode of operations. Focusing on all layers of automation like behavior driven development, test driven development, end-to-end automation and continuous integration and deployment. 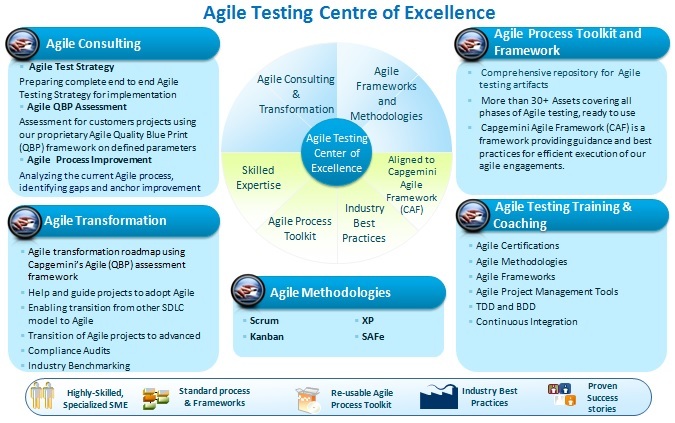 A continuous improvement framework adopted by the agile practitioners at Capgemini, ensures that 100% of the accounts following agile methodology, are tracked for improvement, alignment to the enterprise model of Agile adoption, and continuous capability building leading to technical excellence. The company has seen a growth in the agile expertise from about 40% to 70% in the total strength of agile awareness and practitioners.